From humble beginnings as mechanical apprentices in Wales and Ireland, Sir David McMurtry and John Deer met in the library at Rolls-Royce in Bristol. Together they founded Renishaw, a company with physics, engineering and innovation at its heart. The Gloucestershire-based company has become one of the world’s foremost manufacturers of precision measurement equipment with a valuation of over £1billion. “David’s strength is that he’s a great innovator as well as designer,” says John. “John’s strength is always commercial nouse. He has a great skill of organising things so they can get made,” says Sir David. Sir David and John are joint winners of the 2012 Swan Medal awarded by the Institute of Physics celebrating physics in business. 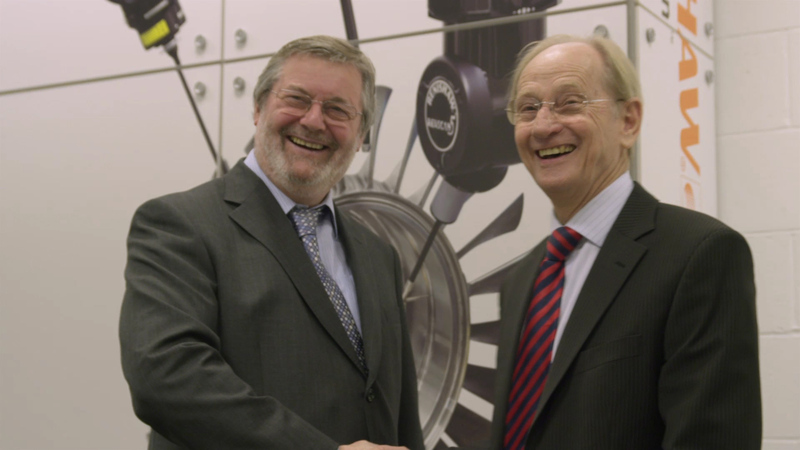 John Deer (left) and Sir David McMurtry founded Renishaw together and have turned it into a £billion business based on physics, engineering and innovation. John: I came from a small town in the Swansea valley. I did an engineering apprenticeship. Sir David: I was determined I was going to go into a career in the aircraft industry so I applied for a job in what is now Rolls-Royce. So I was about 33 when I was deputy chief designer and that was the time that we started Renishaw. John: David and I met in the library of Rolls-Royce and he described a product that he’d invented. John: He showed it to me, on the shop floor, and both of us decided that this is a product that we can sell. John: David’s strength is that he’s a great innovator as well as designer. Sir David: Well, John’s strength is always commercial nouse. He has a great skill of organising things so they can get made. 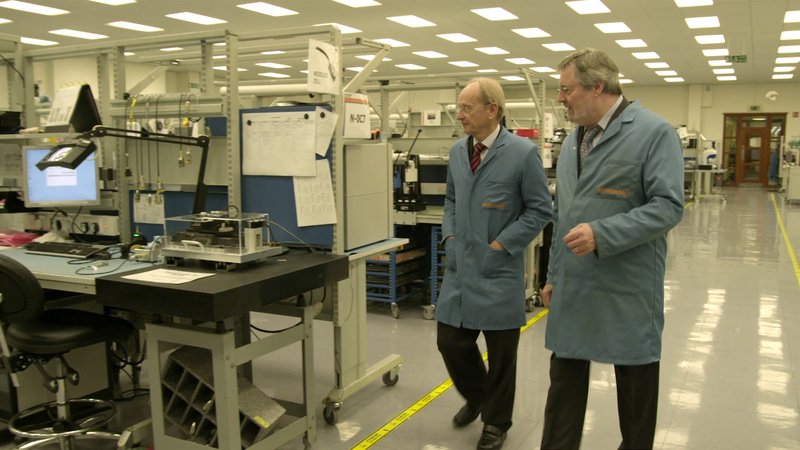 Sir David McMurtry (left) and John Deer inside one of the Renishaw production areas. John: Renishaw started in March 1973 and was based in my home. The garage was the machine shop, dining room the office and my fourth bedroom was assembly. So we carried on for 3 years and then subsequently moved to Wotton-Under-Edge in 1976. Sir David: The areas of science which we are active in is metrology which is the science of measurement. Sir David: The first product came about purely by accident I think. In my role at Rolls-Royce as deputy chief designer I was asked to solve a problem that occurred on the shop floor. They had a coordinate measuring machine trying to measure a instrumentation pipe of a concord engine. The machine they had, had a solid probe on the end, so when you actually pushed it against it to contact it, to see where to measure it, it pushed it out of the way and of course they couldn’t get sensible readings. Sir David: The way to get accuracy out of the probe was to design a probe that when it touches the object, at the instance of touch, it would freezes the coordinate measurements. And that was achieved by using electrical contacts through a series of contact points within it, so that when you touched it, one of them was removed and you processed the signal. John: We were going to be selling to big companies who had absolutely failed to solve the problem of manufacturing a sensor capable of being used on their machines. So we had no problem whatsoever in introducing the product to the major companies in America, Japan and indeed Italy and the UK. John: Research and development is absolutely crucial to Renishaw. If you have strong patents you can charge what the product is worth, rather than competing with another company which drives the price down. John: This reward is for the company and that’s what makes me really proud. Sir David: It puts the company in the spotlight. John: I think people love working here. They come in, in the morning. They pass the lake, see the ducks and swans and I think it gives them a good feeling. John Deer and Sir David McMurtry discuss production with employees at the Renishaw New Mills site. Renishaw, New Mills, Wooton-Under-Edge, Goucestershire, UK. Renishaw, Woodchester, Gloucestershire, UK. September 2012.